BIG LONELY DOUG weaves the ecology of old-growth forests, the legend of the West Coast’s big trees, the turbulence of the logging industry, the fight for preservation, the contention surrounding ecotourism, First Nations land and resource rights, and the fraught future of these ancient forests around the story of a logger who saved one of Canada's last great trees. When the fallers arrived, every wiry cedar, every droopy-topped hemlock, every great fir was cut down and hauled away ― all except one. The solitary tree stood quietly in the clear cut until activist and photographer T.J. Watt stumbled upon the Douglas-fir while searching for big trees for the Ancient Forest Alliance, an environmental organization fighting to protect British Columbia's dwindling old-growth forests. The single Douglas-fir exemplified their cause: the grandeur of these trees juxtaposed with their plight. They gave it a name: Big Lonely Doug. The tree would also eventually, and controversially, be turned into the poster child of the Tall Tree Capital of Canada, attracting thousands of tourists every year and garnering the attention of artists, businesses, and organizations who saw new values encased within its bark. Spotlight explores the stories behind the artists who come to Banff Centre. Author and journalist Harley Rustad joined us at the 2018 Banff Mountain Film and Book Festival to talk about his new book, Big Lonely Doug. This Spotlight video delves into the story behind the second largest Douglas Fir in Canada. + Interview on the Ryan Jespersen Show: "A single tree & a logger changed the way we see B.C. 's old growth forests"
+ Review in the Toronto Star: "When one big tree is left standing in a forest, can we hear its message?" + Toronto Star: "25 books that are going to make a splash this fall"
+ Review and profile in the Globe and Mail: "Meet Doug: B.C. 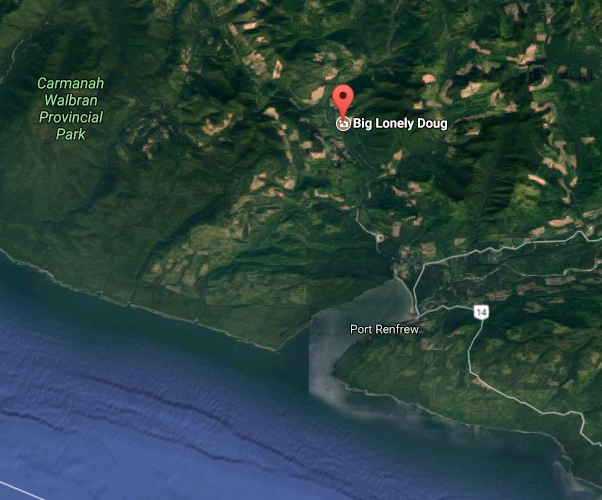 's biggest celebri-tree"
+ CBC names BIG LONELY DOUG one of the "25 works of non-fiction to watch this fall"
Near the Port Renfrew Community Centre, turn north onto Deering Road, continue past the Pacheedaht Campground, and cross over the Deering Bridge. At the Pacific Marine Road junction, turn left and follow the signs towards Avatar Grove. The paved road will eventually turn to dirt. After Avatar Grove, continue along the Gordon River Road for approximately 4 kilometres and take your first right onto a small side road. Continue down to the bridge high over the Gordon River. Park at the side of the road, walk across the bridge, and continue 15-20 minutes on foot along the logging road (a 4x4 vehicle can make it) and keep to the main dirt road. Cutblock 7190 and Big Lonely Doug will be on your right.